For one-semester, junior/senior-level and graduate courses in Reinforced Concrete in the department of civil engineering. Now reflecting the new 2008 ACI 318-08 Code and the new International Building Code (IBC-2006), the Sixth Edition of this cutting-edge text has been extensively revised to present state-of-the-art developments in reinforced concrete. It analyzes the design of reinforced concrete members through a unique and practical step-by-step trial and adjustment procedure. The narrative is supplemented with flowcharts to guide students logically through the learning process. Ample photographs of instructional testing of concrete members decreases the need for actual laboratory testing. Dr. Edward G. Nawy is a distinguished professor in the Department of Civil and Environmental Engineering at Rutgers, The State University of New Jersey. He has been active in the ACI and PCI since 1959 and is internationally recognized for his extensive research work in the fields of reinforced and prestressed concrete, particularly in the areas of crack and deflection control. Dr. Nawy has published more than 175 papers in numerous technical journals worldwide. He is also the author of several books, including Prestressed Concrete: A Fundamental Approach, FifthEdition (2006), published by Prentice Hall; Fundamentals of High Performance Concrete, Second Edition (2001), published by John Wiley and Sons; and Concrete Construction Engineering Handbook, Second Edition (2008), published by Taylor and Francis/CRC Press. He has been the recipient of several major awards, including the Henry L. Kennedy Award of the ACI, the ACI Concrete Research Council Award, the ACI Design Practice Award, honorary membership of the ACI, honorary professorship with the Nanjing Institute of Technology, and the emeritus honorary membership of the Transportation Research Board Committee on Concrete. Dr. Nawy is a licensed Professional Engineer in the states of New York, New Jersey, Pennsylvania, California, and Florida, Evaluator for the Accreditation Board for Engineering and Technology (ABET), Chartered Civil Engineer overseas, and has been a consultant in forensic engineering throughout the United States. × All design examples conform to the Strain Limits Design Method, using the applicable load factors and strength reduction factors. × An updated chapter on seismic design of buildings to comply with the major changes in the ACI 318 Code, and the new International Building Code provisions (IBC 2006) on seismic design. The chapter includes several design examples on confinement, frames, and shear walls. × A chapter on LRFD design of bridge deck structures in accordance with AASHTO 2004, revamped to reflect the changes in torsional and shear strain equations. × A new comprehensive chapter on Strength Design of Masonry Structures, conforming to the latest 2007 Masonry Code. × An expanded section with examples on the strut-and-tie modeling for the design of deep concrete beams and corbels, with extensive design examples using the ACI 318-08 appendix provisions for this method. × Chapter 9 on compression members was totally revamped to reflect the ACI 318-08 approach. × A comprehensive chapter on concrete materials and design of concrete mixtures for normal-strength and high-strength concretes, as well as provisions for environmental structures and a new section with extensive tables on concrete durability. 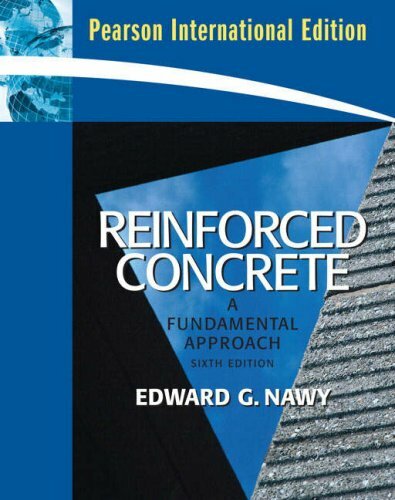 A self-contained textbook, Reinforced Concrete, Sixth Edition can be used for a one-semester undergraduate level course and a one-semester graduate level course in reinforced concrete in standard civil engineering programs. It is equally useful for the practicing engineer. It is the only book that closely and systematically uses and follows procedures in numerous flowcharts within each chapter that simplify the understanding and application of the subject in design. This edition provides thorough coverage of short- and long-term material behavior, design of concrete mixtures, reliability and structural safety, serviceability behavior of beams and two-way slabs and plates, torsion and shear, design of two-way structural slab and plate systems, continuity in concrete structures, seismic design of high-rise buildings in high-intensity earthquake zones, LRFD design of bridge structures, and the design of masonry structures. Comprehensive sketches and sets of working drawings, end-of-chapter problems, pictures of actual structural tests to failure, and flowcharts appear throughout the book. The book also includes an extended appendix of nomograms and tables.